HOUSTON (CN) — Houstonians whose homes were flooded when runoff from Tropical Storm Harvey backed up behind two dams built and managed by the Army Corps of Engineers urged a federal judge Wednesday to let their takings claims proceed. 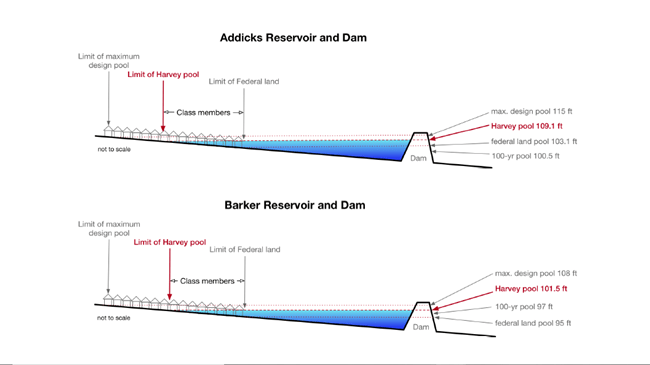 The Barker and Addicks dams straddle Interstate 10, 20 miles west of downtown Houston. The Corps of Engineers built them in the 1940s to hold back the city’s main waterway, Buffalo Bayou. The United States faces 85 lawsuits in the Court of Federal Claims from homeowners and renters who say government officials knew that heavy rainfall captured by the dams would flood their homes, but did nothing to stop development in the area or warn them about the risk. They say that when the Corps of Engineers built the dams it acquired land in the reservoirs expected to flood during a 100-year storm: property with a 1 percent chance of flooding in any given year. But it designed the reservoirs to hold much more water than that, thus putting at risk the subdivisions, schools and businesses that were built behind the dams over the years. Enter Tropical Storm Harvey, a 1,000-year event that dumped more than 51 inches of rain on parts of Houston when it stalled over the city last August. During less severe storms, the Corps of Engineers focuses on protecting homes below the dams along Buffalo Bayou. So it lets storm water build up behind the dams and slowly releases it downstream. But with Buffalo Bayou swollen to record levels by Harvey, flooding homes on its banks in the days during and after the storm, the Corps of Engineers stored 380,000 acre-feet of Harvey storm waters behind the dams for 10 days, which swamped homes with up to 5 feet of water, the plaintiffs say in their master amended complaint. The flood pool was close to the dams’ maximum 410,000 acre-feet storage capacity. An acre-foot is enough water to cover one acre a foot deep: 325,853 gallons. In city planning, an acre-foot is estimated to be enough water to supply a typical suburban family home for a year. At a hearing at the Houston federal courthouse Wednesday, Justice Department attorney Jacqueline Brown told Court of Federal Claims Judge Charles Lettow that homeowners cannot prove a Fifth Amendment takings claims because Harvey was an isolated event, not likely to happen again. “Plaintiffs cannot state a claim for taking when flooding has not been substantial and frequent,” she said. Brown said the homeowners should be applying for storm relief aid from federal agencies, not making their case in court. Reiterating statements she made in a Feb. 16 motion to dismiss, Brown said the government should not be held liable because by deciding to hold water behind the dams, the Corps of Engineers was trying to minimize harm in an emergency. “Plaintiffs implicitly maintain that the Corps should have directed floodwaters elsewhere — elsewhere being onto some other person’s private property — in order to protect plaintiffs’ own property,” the motion states. With 50 people watching from the gallery, Brown said the homeowners’ takings claims fail because they bought property in areas at heightened risk of flooding, and the statute of limitations has expired, as the dams were built 70 years ago. Besides, Brown said, takings cannot be based on the government’s inaction: its decision not to buy all the land in the reservoirs’ maximum flood pools. The Court of Federal Claims has jurisdiction over lawsuits seeking monetary damages against federal agencies. There is a six-year statute of limitations on such claims. Ian Gershengorn, co-lead counsel for the upstream plaintiffs, accused the government of trying to complicate a straightforward case. The Court of Federal Claims is also handling 116 lawsuits from people whose homes flooded downstream from the dams. It has divided the litigants into upstream and downstream groups. “The government built and operated dams that worked just as the government intended during Tropical Storm Harvey,” said Gershengorn, a partner in Jenner & Block in Washington, D.C., who served for six months as acting U.S. solicitor general under President Barack Obama. “They captured billions of gallons of water headed for downtown Houston, and they stored that water on plaintiffs’ property. That in turn caused massive destruction, dislocation and disruption for the plaintiffs. … And that is a clear physical taking of plaintiffs’ property that requires compensation,” Gershengorn said. Gershengorn said the government’s claim that the statue of limitations expired misinterprets the law. “The rule is very simple, and it’s the same in federal and state law: The owner of the property at the time the takings claim accrues gets to bring the takings claim,” he said. Judge Lettow flew out from Washington for the one-day hearing. He said he had yet not seen the Barker and Addicks dams and the flooded neighborhoods in person. The earthen dam embankments are massive: Barker spans more than 13 miles and Addicks a little over 11 miles. In some areas, the structures blend into the landscape as hilltop bike trails. William Baber, 64, owns home in a subdivision behind the western edge of Barker Dam. “It was terrible. It was unbelievable. They had to take me out by helicopter. The water was up to here,” the 6-foot Baber said after the hearing, holding his hand up to his chest.